Being two weeks into the internship, a few things have become apparent. One thing in particular that has struck me is how In find myself reacting every time I see a new candidate. We as a group have seen seven candidates speak now and each time my initial reaction is a bit different (like when I saw my candidate for the first time I think I almost melted right then and there). 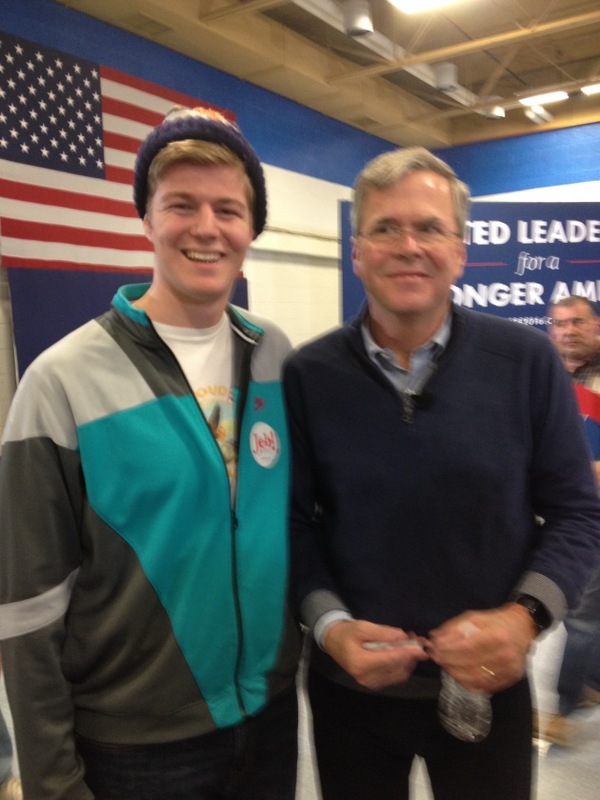 Perhaps the most astounding experience I have had so far with a candidate was the one I had with Jeb! the other night. I went up to him after the crowd had withered down, hoping to get a quick picture. As I stood beside him, quite awkwardly I might add, he said in my general direction, “Man I am tired.” This incredibly simple statement really threw me for a loop. I have not met many people others would deem as “celebrities,” so I have never really spent much time thinking of them as human. I then started thinking, “how do I start a conversation with this guy?” I spent some time mulling that over, and eventually settled on “so are you heading back to Iowa then?” He turned to me, a little surprised I think, and proceeded to tell me about his next ten stops which included a stop in Miami and a few fundraising excursions. I then took a photo next to him and found that like me he is a bit of a tall, lanky fellow. I feel like this can be important when considering democracy as a whole. We spend all this time staring at TVs viewing these candidates in the same regard as movie stars or comedians when in reality they are supposed to be public servants. We aren't electing these people to walk in a fashion show or make us laugh, we are electing them to make tough choices that impact our every day life. -- Tristan Voegeli is a St. Olaf freshman from Winona, MN, majoring in Political Science. He is in New Hampshire as part of a St. Olaf political science class studying the presidential election.